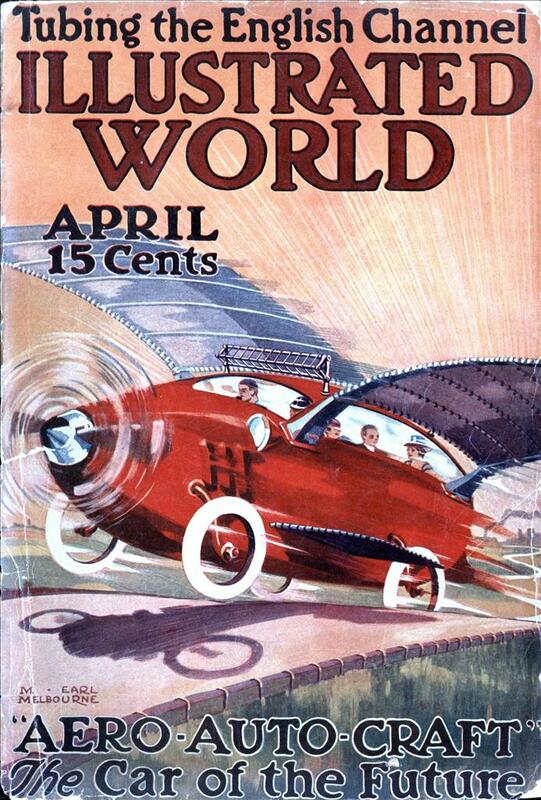 By J. J. TERRELL. M. D.
LITTLE four-year-old girl surprised everybody the other day by writing quite plainly on a piece of paper, “Six bars of window soap”. The little girl is left-handed. She could not read what she had written. On investigation it was found that she had received no instruction in writing but had watched her mother writing these particular words on an order blank a few days previously. She had reproduced the picture from memory. The little girl will go to school next year and her teachers will probably wish to break her of what they deem the bad habit of left-handedness. Should the teachers be permitted to consummate their purpose, such genius or brilliancy as the child may possess will be seriously restrained. In fact, educators who have studied the question assert that an artificial transfer from left-handedness to right-handedness imperils a child’s mental development. The teachers are generally slow to learn. It is as hard to teach a teacher as it is to doctor a doctor or nurse a nurse. A little boy who has been in school a whole term was brought to me the other day for advice. Throughout the boy’s .first term he has been using his left hand. He now enters his second term under :,a new regime of penmanship and the teachers reluctantly decide that they must make the boy right-handed, after all. Their ruthlessness in this determination has made the poor little fellow nervous, and that is why he comes under medical observation. Measurement of the ulna-plus shows that the left arm is the one Nature intended the boy should use. He therefore receives a certificate from the family physician, stating that it would be detrimental to the boy’s nervous system and brain development to insist upon a transfer to right-handedness. And the teachers will have to shake their heads in grave doubt every time they notice that poor, misguided left-handed child standing out conspicuously from the right-handed line of scholars. Perhaps it is only fair to state that the boy attends a public school where outdoor recess is never granted unless parents or physicians take a hand, and whispering is considered a penal offense worthy of half an hour of detention of the inhuman culprit. Something like four per cent of people are naturally left-handed. A small minority of these born left-handers are broken of the habit and educated as right-handed individuals. The brain centers which control the most delicate movements of the hands and fingers are closely related with the center of speech. The speech center, in right-handed individuals, is situated in the left third frontal convolution under the temple. This explains why a cerebral hemorrhage (stroke of paralysis) which involves the left side of the brain paralyzes muscles on the right side of the body and also the function of speech ; whereas a hemorrhage on the right side of the brain paralyzes muscles on the left side only. Expression, both facial and bodily expression, is most highly developed in people who are well educated, and it is feeble in those of untrained or feeble mind. An experienced physician, or any other good observer, can form a pretty reliable opinion of an individual’s mental status by a mere glance at his face and body when he is talking. Training the hands to do fine or delicate work is sure to develop the power of speech at the same time, and vice versa, because of the intimate associations between the controlling centers of these functions. Now there is no doubt whatever that a latent speech center does exist on the right side as well as the left, in a right-handed person. We know this because in certain cases of apoplexy (cerebral hemorrhage) in which speech is destroyed, the victims have uttered words or sentences under great emotional excitement, as in a fire, for example. Likewise persons whose speech has been completely destroyed by a stroke of apoplexy may be taught again to speak, just as one teaches a baby, by patience and perseverance, pointing out objects or familiar things and naming them over and over, etc. Of course such speech remains inadequate, yet it is speech of a kind sufficient for the unfortunate to make known his simpler wants. Only by assuming the existence of a latent speech center in the right side of the brain can we explain this fact. A measurement of the “ulna-plus”, referred to above, appears to be a reliable indication of right-handedness or left-handedness in a child. It was described in Illustrated World for September, 1916, as applied -by Professor W. Franklin Jones, head of the Department of Education in the University of South Dakota. The length of the ulna-plus (practically the length of the forearm from point of elbow to first joint of little finger) is greater in the arm Nature intends to be used, according to Professor Jones. He detects right-handedness or left-handedness even in young babies by this measurement. With this readily obtained anatomical evidence of left-handedness or right-handedness, as the case may be, we are in a position to talk turkey to the school-ma’ams, and turkey is the language to use if you wish to teach a teacher something. The proposition is clear: Given a child with expression centers situated in the right cerebral hemisphere (that is, a left-handed child), may we safely insist upon the training of the latent expression centers in the child’s left cerebral hemisphere—supposing latent centers are there ? The answer is No. Don’t try to buck Nature. Let left-handedness alone. An artist born left-handed was compelled by ignorant teachers to use his right hand at an early age. As an artist he is right-handed, never painting with his left. He has unusual artistic sense, which is certainly a heritable characteristic, but his technique is inferior to his artistic sensibilties. This is the result of the unnatural transfer to right-handedness. The latent left-brain centers have been developed to a reasonable degree by education, but the artistic sense must be over on the neglected right side of that man’s cerebrum. Landseer, the modeller of the lions of the famous Nelson monument in London, was luckier. He could and did use his left hand. He was famous for his technical skill. He could work with tremendous rapidity, and do finished work, too, and he astonished a group of artists once by simultaneously drawing excellent pictures with both hands—a stag’s head with one hand and a horse’s head with the other. As a painter he was rapid but sure and deft with the brush. His school teachers evidently did not suppress the left-handed propensities of this great genius. I have particularly inquired into the history of a large number of patients of the nervous, restless, miserable, uncontented, neurotic or neurasthenic type, and it has been a great surprise to find that much more than four per cent of them were naturally left-handed but forced to suppress the right cerebral development and train the right hand to do what Nature intended the left to do, early in life. 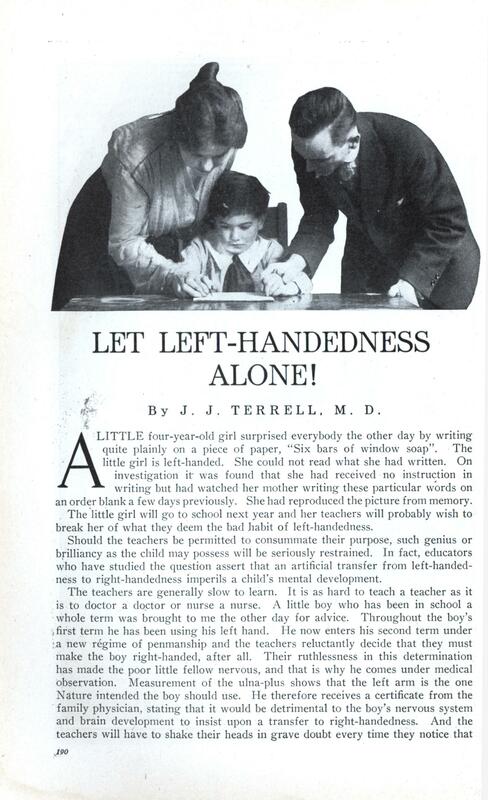 Some educators who have investigated the thing at great length go so far as to say that artificial transfer from left-handedness to right-handedness is likely to render the child an imbecile. This is an exaggeration, as observation amply shows. But a forced transfer certainly can do the nervous system no good. A careful study of the problem from all angles, and extending over a term of years, has forced me to the conclusion that the only safe way is to follow this common sense and reliable axiom: Let left-handedness alone!